Vintage is often a term that is used when describing fashions from the past that aren’t quiet at the level of being considered antiques but are still classics. Vintage engagement rings can be from any time period considered to be more modern than ancient, typically from the early 1900’s to the retro period of even into the 1970’s. Determining if engagement rings are vintage or not depends on the year that the ring was made as well as the elements of the ring design. 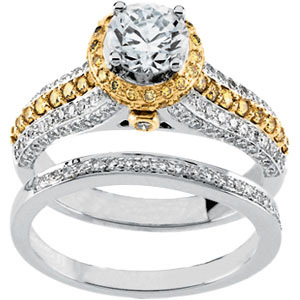 Most rings considered to be vintage will have a combination of yellow and white gold in the band and setting. There are some vintage rings that are made of platinum or some with one metal only. Narrow bands at the back widening to larger settings at the front of the engagement rings from this time period are very common. Generally if the band is two tone, the white gold will be located on the front of the ring to provide reflection for the diamonds and add to the overall design. Mountings and settings were commonly done in white gold during the early 1900s and continue to be very popular. The stones in vintage engagement rings tend to be somewhat smaller than are seen in many of the new diamond engagement rings however they are also more of the moderately large stones. Often other gems are also combined with diamonds in beautiful settings that highlight both the diamond as well as the surrounding gems. For those vintage rings with a single, larger diamond a cushion cut diamond is very popular. Engagement rings with this type of diamond cut tend to be simple yet elegant and true classics. Cushion cut diamonds can be oval to rectangular in shape and provide a softer overall appearance to the ring than round or princess cuts. Historically the name for cushion cut diamonds was candlelight diamonds. This is because lighting was from candles and the beautiful cut of the diamond gives off a soft, firely glow in any type of direct or diffuse light. Typically shapes for the cushion cut diamonds include oval to rectangular with rounded or blunted corners. Open, long facets on many of the diamonds on older engagement rings give a unique light reflection to the interior. The colors are still vibrant and there is fire, it is just less sharp. Many people see these types of cuts as very romantic looking and may be enhanced on the band with smaller diamonds. Looking at all the detail and filigree work on some of the older vintage engagement rings will help you gain an appreciation of their beauty. If you are designing your own engagement rings or wedding set you may want to incorporate design ideas from some of the vintage sets you view. This entry was posted in Antique engagement rings, Gold engagement rings, Vintage engagement rings and tagged Antique Engagement Rings, Antiques, candlelight, candles, cushion cut diamond, cushion cut diamonds, cut of the diamond, designers, diamond cut, diamond engagement ring, diamond engagement rings, diffuse light, early 1900s, engagement, engagement rings, gems, mountings, narrow bands, princess cuts, reflection, ring, time period, true classics, vintage engagement rings, vintage rings, white gold on August 29, 2009 by Donald.